You may be at a time when it comes to making a decision on whether to buy a new boat trailer or upgrade your existing trailer. 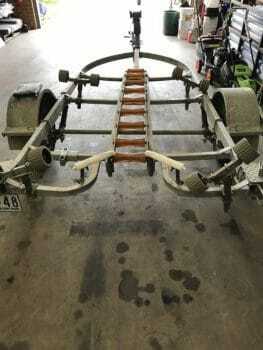 Below we have various options that you can choose which allow you to upgrade your existing boat trailer with brand new trailer parts and accessories. All boat trailer kits include brand new boat trailer rollers, boat trailer bunks or bumper cover profiles along with all brand new brackets and hardware. Simply review your options below and contact us for further information or any questions you may have. We are always adding more options and different selection of kits! Be sure to book mark this page, or talk to us to discuss a custom kit to suit your boat trailer and your needs today. For customers located in Melbourne, Victoria. We now offer an installation service at our primary factory in Hastings. Contact us today for further information and to discuss your boat trailer kit and installation process further. 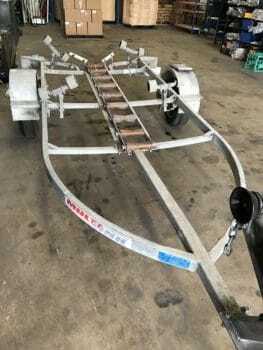 2x Boat Trailer Bunks with 45 Degree Angles (2 Meters). 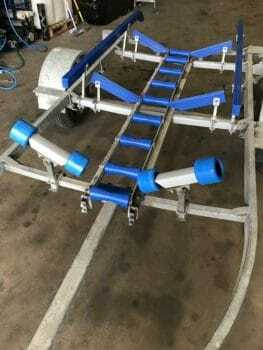 6x 400mm Boat Trailer Bunk Flippers. 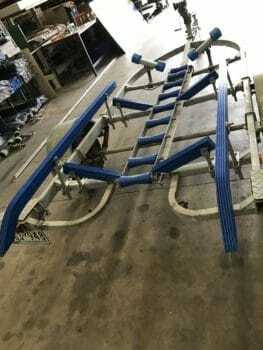 5x 8 Inch Blue HDPE Keel Rollers With Aluminium Ladder Brackets & U-bolts. 5x Roller Spindles To Suit Keel Rollers with Split Pins. 10x Wood Yoke Stem Brackets To Support Bunks and flippers. 10x 2″ x 2″ Tube Side Adjuster Brackets. Note: Boat trailer kits can be modified to suit individual needs. simply contact us to discuss your needs.